At the moment our FAQ's are limited to timber flooring only. In time it is our intention to provide more useful insights and suggestions covering polished concrete and epoxy coated floors. In the interim, please feel free to email or call Nathan at Higher Ground Floors. Whilst we are usually busy laying new floors, we'll endeavour to respond to your enquiry as soon as possible. What preparation do I need to consider/undertake before sanding and coating? Make appropriate arrangements for alternative accommodation when required and advised to do so, this is especially relevant for remote and large projects. 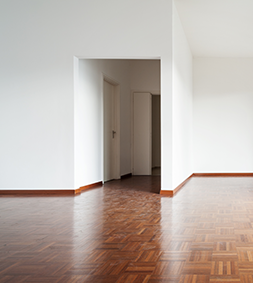 Prior removal of all furniture, unless agreed otherwise, as well as any floor coverings including staples and tacks. Prior removal of all electrical and gas appliances by qualified trades. Consult your floorer and respective trades with respect to the most suitable time for undertaking sanding and coating, especially when you're building or renovating. Complete all necessary carpentry, electrical work, gyprock, glazing and plumbing before commencing your flooring. All painting of skirting boards should be completed before flooring, except the final coat which can be applied after flooring. What else should home owners consider? Readily accessible power for the operation of electrical tools and mechanical equipment. Safe access to the work site. Cover and secure all furniture including in adjacent rooms with drop sheets or plastic. Close doors to any adjacent rooms. Close off any fireplaces and any vents that could allow wind or dust to enter the room. What you can expect when your floors are professionally laid? An explanation of the work to be carried out. A quote describing the services to be undertaken. Holes, cracks and gaps to be filled with the appropriate timber filler. Superior coating and finish that will last many years when properly cared for. Total removal of deep gouges within the floorboards. Total removal of stains such as oil or water stains. Filling of the gaps between the boards, required to accommodate shrinkage and expansion. Floorboards damaged by termites or borer will not have the same appearance as those in good condition. And may even need to be replaced. Cracks and gouges filled with putty will not have the same appearance as regular timber after the application of coatings. Whilst Higher Ground Floors will take all necessary precautions to reduce dust, including vacuum removal, due to the nature of sanding, it is virtually impossible to eliminate all dust. Some dust will be present on the newly sanded floor and throughout the the house. What else should home owners be aware of? Any glues, silicone and unwanted surface coatings need to be removed prior to sanding, as they can block the sanding papers and machinery. Marks on skirting boards from contact with the edger which is why we recommended final painting of the skirting boards after the floors are finished. Variation in appearance, colour and grain may be noticeable between new and old boards. How can I care and look after my new polished timber floor? Use curtains or blinds to minimise fading caused by direct sunlight exposure. Place mats at doorway entrances and wherever possible to capture dirt and grit carried on shoes which can damage a newly coated surface. Undertake regular vacuuming to remove excessive dirt and grit from the floor and materials which may hold and spread particles such as rugs and matts. Undertake regular cleaning and washing of your floor using appropriate and professional cleaning equipment and substances, such as sponges, mops and flooring detergents. Re-apply surface coatings when necessary and before they become too worn. When can we walk on our new floor? You can walk on your new floor wearing socks when it is clearly touch dry usually after 24 hours. Do not to walk on your floor wearing shoes for at least a week after application. Heavy items such as furniture, pianos and fridges should be moved carefully to avoid damage and scratches.